Brexit Britain: are we all haunted by collapse? “The EU is literally following in the steps of the Soviet Union. I’ve been thinking about it since everything started with Greece… Britain will be the first country.” Part two. Hundreds of people gather in Croydon, south London for one of the Labour Party's final campaign rallies before the general election on 6 June 2017. NurPhoto/ Press Association. All rights reserved.For many people living in the United Kingdom and abroad, Brexit was experienced as a sudden rupture in the normal state of affairs: after forty years of membership, the British people voted (by the smallest of majorities) to leave the European Union. Beyond the anxieties over what this would mean in practice, some also saw in Brexit the spectre of how previous supra-national blocs, such as Yugoslavia and the Soviet Union, began their collapse seemingly out of nowhere. This theme of sudden, unexpected (and yet, in hindsight, wholly predictable) collapse came back time and again during the three months that I spent conducting research among Remainers in London. On my very first night, I was at a talk in Central London titled Brexit: An Unorthodox View. Former Greek finance minister Yanis Varoufakis, Turkish novelist Elif Şafak, and Croatian philosopher Şrećko Horvat were there to bring a European perspective on Brexit and talk about the nascent Democracy in Europe Movement 2025 (DiEM25) – Europe’s first transnational movement-party – in which they work as coordinators. Horvat in particular drew similarities between Yugoslavia and the European Union, arguing that the toxic combination of rising nationalism, labour reforms, and IMF-mandated structural adjustment programmes that contributed to the disintegration of Yugoslavia could also be perceived — albeit in different ways — across Europe today, from the Greek debt crisis to the rise of populist, often ethno-nationalist parties in various European countries. Shortly after the Brexit referendum, many were concerned that if the Netherlands, France, and Germany were to elect populist right-wing governments, Brexit might turn out to be the beginning of the end for the EU, especially given Donald Trump’s election as President of the United States. But after twelve months of government mismanagement, gaffes and general confusion about Brexit, that worst-case-scenario no longer seemed as likely, so much so that Brexit had apparently “vaccinated Europe against populism.” After twelve months of government mismanagement, gaffes and general confusion about Brexit, that worst-case-scenario no longer seemed as likely… Brexit had apparently vaccinated Europe against populism. Yet it was tempting to read Brexit as the beginning of the collapse of the EU. Euroscepticism has become a common refrain among populist parties across Europe, both on the left and the right. This being the case, if the UK was indeed a bellwether for things to come, then it made sense to look at the immediate aftermath of the referendum, and see how people were reacting to Brexit in those crucial first months. This, in short, was the rationale for my research project, which I conducted as part of my Master’s degree at Utrecht University. Surprisingly, what I found was that this feeling of rupture or collapse did not lead to resignation, but rather to an explosively creative reimagination of politics at many different levels. By provoking (or rather, revealing) a rupture in British society, Brexit had the unintended effect of opening up new space for alternative forms of politics. It was that moment of uncertainty itself, the feeling of being caught in between, that acted as a major driver for political participation among Remainers, leading to intense debate about why the referendum went the way it did, and what this would mean for the shape of British politics in the years to come. There has also been a similar level of concern among British social scientists, the majority of whom – incidentally – voted Remain. It’s as if Brexit, with all the rupture it represents, is suddenly also able to hold together many different articulations of social issues in Britain, like economic inequality, populism, postcolonial memory, local identities, and so on and so forth. It isn’t a stretch of the imagination to think that, had the result gone the other way (that is, if Remain had won by the same tiny margin), there would not have been the same urgency to discuss or debate why 48 percent of voters preferred to leave the European Union. By provoking (or rather, revealing) a rupture in British society, Brexit had the unintended effect of opening up new space for alternative forms of politics. In a sense, the Brexit referendum was a catalyst that opened up space for new debates and discussions, and as a result, for the emergence of new social and political realities that were harder to discern previously. Counter-intuitive as it may seem, Brexit has been a very significant political opportunity for almost everyone except UKIP – whose support fell off a cliff shortly after the referendum – and Theresa May’s government, stuck in the uncomfortable position of actually trying to make Brexit work. Obviously, before being a political opportunity, Brexit is an utterly calamitous prospect for many people. The blatantly xenophobic murder of a Polish man in Harlow less than three months after the referendum was just the violent tip of the iceberg. At a more deeply felt and personal level, Brexit has made many non-British European nationals became suddenly self-conscious about their accents and apparent foreignness, often feeling unwelcome for the very first time. Writing for Vogue magazine, Italian Londoner Cristina Ruiz explained the complex and messy range of feelings she had the day after the referendum. Even if settled EU nationals are allowed to stay after Brexit, “something has profoundly shifted in our relationship [with the UK]”. Sadly, the alarming uncertainty that many people experienced after the referendum was completely avoidable: there was no reason for the Home Office to send out cryptic letters urging EU nationals – many of whom have been living in the UK for decades – to “make arrangements to leave,” especially when the government, the civil service and the EU itself are still at loggerheads over what should be done. If Brexit itself was reason enough for Remainers to mobilise, the government’s spectacular missteps and blunders only brought them closer together, setting the stage for the kind of contentious politics that often prefigures the emergence of a social movement that is able to really impact politics in a country. Open Britain, for instance, a campaigning organisation which started off as a platform for elite Remainers such as Tony Blair, has recently begun broadening its interventions, promoting grassroots campaigns such as One Day Without Us, as well as organising activists at a grassroots level. At a local level, dozens of pro-EU groups have been growing across the country, rallying on Twitter and other social media in a concerted attempt to halt Brexit once and for all. These efforts at kickstarting a broad-based anti-Brexit social movement may or may not succeed. But they do tell us something important about what happens when democratic societies go through such moments of abrupt turmoil. In 1927, democratic theorist John Dewey published his seminal book The Public and its Problems, in which he argued that it is the direct (or even indirect) experience of collective harm that causes people to come together, organise and push for change, forming what he calls a public. Dewey draws a distinction between a public and the public, and this distinction might be more relevant than ever in our current situation of increasingly polarised politics. The public is not some kind of monolithic entity with a single will that governments can consult whenever needed through referenda and elections. There is not just one ‘will of the people’ because effectively there isn’t just one continuous, unchanging public. As Dewey argues, a public does not preexist a problem, but rather emerges in response to it. Publics are plural, contingent, and they’re quite often temporary and short-lived as well. Publics are plural, contingent, and they’re quite often temporary and short-lived as well. Democracy has always been based in pluralism and difference, in different sides agreeing to disagree. But with globalisation and the exponential growth of new technologies over the last few decades, the gaps between different constituencies seem to have only grown wider. In the early 1990s, Samuel Huntington notoriously argued that globalisation and the end of the Cold War would lead to a situation in which individual civilizations would come to recognise themselves more and more as such, as solid and homogeneous cultural blocs with a firm, well-defined identity. In fact, the opposite is true: far from making nation-states more cohesive, globalisation has had a very irregular effect on societies. Some have benefited, whilst others have seen a steep decline in their quality of life. In the UK, the uneven effects of globalisation have become clear for all to see: since the 1980s, London has truly become a global city, a major player in the world financial sector, at the same time as many rural parts of the UK have stagnated, and seen their historic industries outsourced to cheaper parts of the world economy. When it comes to something like Brexit, different political opinions map fairly accurately onto these geographical differences: affluent, mobile city-dwellers were more likely to vote Remain, whereas people in rural or post-industrial areas, where the local economy has suffered more sharply from the effects of globalisation, tended to vote Leave. But while this might account for some of the systemic inequalities underpinning the Brexit vote, it fails to explain what happened almost a year later, when, against all odds, the Conservative government lost its parliamentary majority to a resurgent Labour party. New technologies, especially social media, were an explosive wild card both during the Brexit referendum of 2016 and during the general election campaign of 2017, consistently defying opinion polls and scrambling almost everyone’s expectations of what might happen. Many commentators assumed – with good reason – that Brexit would be the single defining issue of the general election campaign, and that Remainers would come out in force to back the Liberal Democrats or the Greens, both of which remained unambiguously opposed to Brexit. 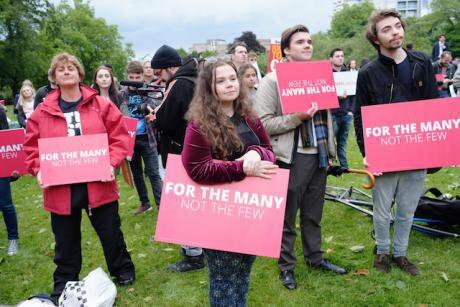 Instead, an energetic grassroots campaign led by Labour party members saw a dramatic increase in participation and debate around issues of economic justice, austerity, and inequality. Labour ended up gaining 30 seats both in Leave-voting and Remain-voting constituencies, whilst the Liberal Democrats gained only 4 seats, and Caroline Lucas remained the UK’s single Green MP. Labour ended up gaining 30 seats both in Leave-voting and Remain-voting constituencies, whilst the Liberal Democrats gained only 4 seats, and Caroline Lucas remained the UK’s single Green MP. Material inequalities are certainly an important part of the vote: eight years of austerity have led to the longest fall in living standards since records began, and for many, economic justice and a different social contract may be more important than uncritically pledging support for the EU – after all, David Cameron and George Osborne were pro-Remain. But another significant piece of this particular puzzle is social media. At its core, social media is an infrastructure of mass communication, a virtual environment in which more and more people are taking part, especially when it comes to politics. In the last few years, social media has gained an increasingly central role in politics, although its impact on our democratic process is still completely unpredictable. The Brexit referendum was painful for many people, and the period since has been a confusing, uncertain period. But, all in all, it also somehow offers the glimmer of a promise for a better democracy. The sharpening inequalities in this country have become more visible since the referendum, and instead of despairing, people have begun organising around these problems, establishing politics through social media as a way of articulating new horizons of public intervention in society.